Coinciding with the highly-anticipated 2016 Summer Olympics in Rio de Janeiro, Madame Tussauds Washington, DC has welcomed the figure of Olympic gold medalist Michael Phelps. Initially launched by Madame Tussauds San Francisco in 2014, Phelps’ figure, will remain in the nation’s capital throughout the 2016 Summer Olympics. 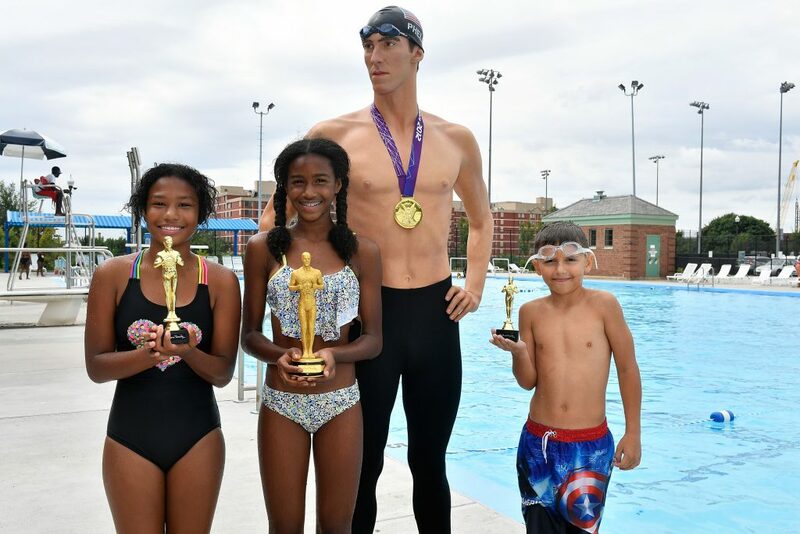 To celebrate the arrival of the Olympian, Madame Tussauds DC partnered with the DC Department of Parks and Recreation (DPR) to unveil the figure at Banneker Pool in downtown DC, inviting aspiring young swimmers to interact with the figure. Overlooking the large pool and surrounded by cheering fans, Phelps’ figure looked right at home. Children were invited to participate in swim competitions where the grand-prize winner took home free admission for a family of 4 to the famed DC attraction. Born nearby in Baltimore, Maryland, Phelps found a love for swimming at the mere age of seven. Since then, he has spent innumerable hours in the pool and participated in the past four Summer Olympic Games. He is the most decorated Olympian of all time. Rio is Phelps’ fifth and final Olympic endeavor as he takes one final lap, coming out of retirement at the age of 31 to again compete against the world’s elite. Out of water and away from his stellar career, he has recently become a father to his son, Boomer, with fiancée Nicole Johnson. Madame Tussauds Washington, DC is an interactive immersive experience, where visitors are able to touch, see, and hear major historical events and celebrities. The attraction, highlighted by the Presidents Gallery, which features wax figures of all 44 US Presidents, showcases likenesses of some of the world’s most recognized individuals, including international superstars Zac Efron, Angelina Jolie, Brad Pitt, Beyoncé, Michael Jackson, Taylor Swift, Miley Cyrus and Rihanna; entertainment and sports giants Jimmy Fallon, Oprah Winfrey, Babe Ruth and Tiger Woods.